This dressing up and protecting your iPhone and iPad at affordable prices post, has been brought to you by CaseCow…. I bet at any given time when you see me (or my husband for that matter), you see me with my iPhone 5. The only time I don’t have it on my person, or lying next to me, is when I’m in the bathroom (and sometimes even then, if it’s in my pocket or handbag) or when it’s on charge. It is like an extension of me. It is my must-have gadget for sure. At least fifty percent of the time I have my iPad with me, too. I use my iPad for note taking and scheduling things in my calendar when I go to meetings. My husband and son have the iPad Minis and my son especially, loves to change the look of his whenever he can. Everyone who knows me already knows this, but I’m also really big on accessorizing. I love accessories. And my Apple products need accessorized, too. A girl has to have her gadgets looking, good, am I right? I like to change my cases to fit what I’m wearing or my mood, but who can afford to do that? I can. And YOU can! 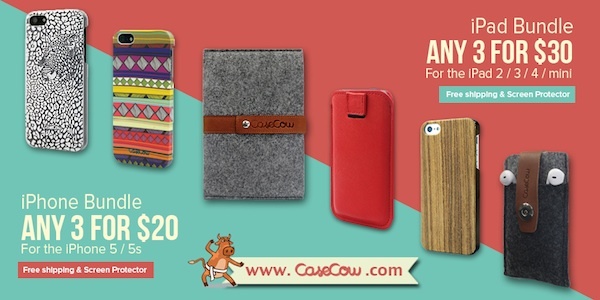 Check out this incredible site-wide bundle sale at www.casecow.com — over 150 styles of iPhone / iPad cases available. They have cases made of aluminum, wood, genuine leather, felt, polycarbonate, etc. Some of their products alone cost $29.99 so this is a great deal! As I said, I love to dress my iPhone 5 up, but I’m also a bit rough on my iPhone, so I really must have a case for added protection. I love a good sale and this sounds like the perfect time to stock up on some stylish cases. Oh, and they would make great Christmas gifts, too. It’s nice to see this as an option! I just got the iphone 5s this week and the cases in the Apple store are way too expensive. I’ll have to check them out as I need a case. Seriously, you can’t beat this deal. And some really pretty and stylish cases, too! That’s a great deal! I’m tired of paying $50 for cases. I just bought my daughter an iPod Touch, and decent cases don’t come cheap. Thanks so much for sharing! My daughter wants a new cover. I need to check them out, my phone case is on it’s last leg. That is a great price. Usually 1 costs even more than that! I just purchased an iPhone 5 for my daughter and she definitely wants a new case, thanks for sharing! three iphone cases for $20 is a steal! I’ll have to check it out! Thanks for letting us know about some affordable options! I am a bit rough on my phone, so a good case is a must. Wow, those cases are pretty cheap! I paid almost twice that for my iPhone 5 case! That is an amazing deal for cases! That’s such a great deal. I’m hoping to get an iPad for Christmas so I will need a good case. I have a great assortment of cases for my iPhone and iPad – it’s almost embarrassing really LOL. A good case is so important and this is a super deal! I like to change mine from time to time so with this price point, I could do it more often! This is such a cool site for cases! They have such reasonable prices too! This is an awesome site; too bad they don’t sell cases for the iPhone 4 as their prices are great!! Wow, those are some great prices! I love the prints too.